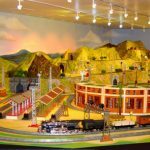 Testimonials – SMARTT: Scale Models, Arts, & Technologies, inc.
"The toy train layout SMARTT created is state of the art and the center piece of the "Small Wonders: The Magic of Toy Trains" which is one of the finest toy train exhibits in the world. This exhibit and the train layout continue to be one of the biggest and most popular attractions at the California State Railroad Museum. I would give my high recommendation to Scale Models, Arts, and Technologies to anyone interested in contracting for a scale model or toy train layout." Banco Popular de Puerto Rico has made an effort to propose alternatives to our city's transportation problems. 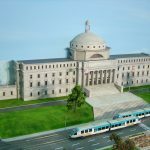 Our exhibit, On Rails: Another Way of Moving in Old San Juan, is an effort to generate community involvement in support of a tram for the downtown district of Santurce-San Juan. 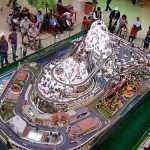 The scale model that we planned as part of the show has been a major attraction since we inaugurated in 2007. We were fortunate to plan the model right from the beginning with SMARTT - this allowed a collaborative environment and understanding...Their experience was essential; building a 38 foot model is a major project." “I am pleased to express our appreciation and satisfaction with the amazing success of ‘Aventura Station’ model train. 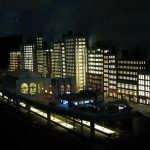 “I contracted with SMARTT to build and install a comprehensive three rail O gauge model train layout that would fulfill my dreams and provide me with many hours of pleasure operating trains on a realistic, complex layout. The layout has operated flawlessly for the past three years and has exceeded my expectations…. Working with SMARTT was in itself a rewarding experience. The quality of their work speaks for itself, and they were always offering helpful suggestions. The entire staff handled everything in a professional and reliable manner, both during the build, and the support they have provided me thereafter. Being a significant investment, it’s been worth every penny. "Since installation in 2006, the layout has performed flawlessly, providing hours of enjoyable entertainment....Throughout the build and installation process, Mr. Hart and his team exhibited strong professionalism and attention to detail. ... A level of trust was established that created a comfortable working relationship and led to more than satisfactory results...The greatest compliment I can provide is that this endeavor was a focused and easy process, and frankly, quite enjoyable. I would highly recommend Mr. Hart and SMARTT for any model train project, and would choose him again were the opportunity to present itself." "I selected SMARTT to design and build my HO scale layout after interviewing several companies that advertised their ability to build 'museum quality model railroads.' It was the right decision. The plan they designed was a vast improvement over my original design concept...The operational possibilities are exceptional. Although I am located in California, and SMARTT is located in Florida, the project proceeded seamlessly. Frequent emails and telephone conversations -- often daily -- along with photos and videos, provided a continuous flow of information and ideas that allowed the project to proceed with no surprises. Changes along the way that I requested were handled with no difficulties. The final project was delivered and installed with no problems. The entire staff at SMARTT that I worked with was exceptionally professional and skilled -- all the way from the model makers (approximately 100 structures were built) to the scenery and track builders. SMARTT's expertise in dealing with the complexity of the DCC layout and the software to control it was especially noted. The electronics, including the control panel with track occupancy indicators, and the lighting effects throughout the layout, were all designed and built by the SMARTT staff and demonstrated exceptional skill. My investment in this project has been well worth it." All of this may give you an idea of the extent of the layout but what is really wonderful about it is the great detail.... At my request, the entire layout is also controllable from a computer that can have multiple trains running at the same time with complete safety....The installation was very professional, with a team from SMARTT assembling the layout without issue despite its having traveled across the entire United States... The support after delivery has been excellent. I doubt that any other company in America could handle a layout of such complexity with such excellent results."